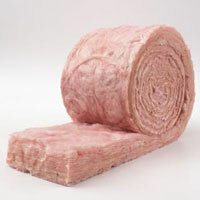 Fibreglass insulation is one of several alternatives for soundproofing or temperature control. Fibreglass, rock wool, and slag wool have successfully replaced asbestos in many uses where such insulation is needed. Fibreglass wool is used, for example, as wall insulation or machinery insulation, with ventilation ducts, and in or on ceiling tiles. In addition, it is a better choice than some forms of insulation because fibreglass is not made from chemicals and is fire resistant. Although there has been some dis cussion regarding the health risks posed by fibreglass wool, particularly about possible cancer risks, all sources we consulted agree that fibreglass, rock wool, and slag wool do not likely pose the same risk as asbestos and refractory ceramic fibers. Asbestos and refractory ceramic fibres do pose a cancer risk. However, the sources do recommended caution when using or disturbing all of these materials, and this is particularly true in schools and homes where children are present. Applying fibreglass insulation to the outside of air ducts and sealing it with foil or other protective covering is preferable over the long term. It was a common practice to line the inside of air ducts with fibrous insulation, and it is still sometimes done today. However, some professionals have concluded this is not a good idea after repeatedly finding visible dirt and sometimes mould growth within the fibres of damaged duct lining, often in older buildings or in systems with a particulate pollution source (such as after a house fire). Such dirt can never be cleaned away. The trapped dirt can grow mould if dampness is present, and this dirt, along with the chemicals, microbes, and other contaminants in the dirt, can be set free to contaminate indoor air. Filter mediums can be cleaned or discarded, but it is hard, if not impossible, to clean dirty duct lining. As well, particles of fibreglass can break away when fibreglass is disturbed. Fibreglass breaks down over time, and when air flows past the risks for harm increase. Fibreglass particles tend to be larger and tend to fall, but smaller particles will go where the air takes them. The risk is mostly of skin, eye, and throat irritation, which are not serious threats to health, but they can affect well-being. It is better to avoid these irritants, especially with children, asthmatics, and those with environmental sensitivities. Experience has shown that symptoms such as rashes can sometimes be helped by removing fibreglass lining from inside ducts. In general, fibreglass should be isolated from breathable air. Some sensitive individuals report off-gassing of chemicals from newer fibreglass insulation. This may simply be trapped air from the manufacturing site that is being pushed out during handling. The specific source might not be known, but when insulation comes in direct contact with heating pipes, chemically sensitive individuals have reported symptoms from the resulting fumes. Again, foil-wrapped/sealed insulation outside the pipes tends to solve the problem. The Healthy School Handbook identifies particular concern with breathable particles that can enter the lower, deeper areas of the lungs. [iii] Particles smaller than 20 microns can be inhaled. Sizes between 10 and 20 microns can be deposited in the upper respiratory tract (nose, pharnyx). Less than 10 microns can reach the tracheobronchial and pulmonary areas and are classed as “respirable”. These pose a risk when they interfere with the lungs’ ability to exchange gasses (a clogging effect) and when they cannot easily be broken down by the body’s defences. For example, the risks of fiberglass are less than those posed by asbestos. Asbestos fibres are respirable, but according to the Healthy School Handbook fibreglass fibres used in duct and cavity insulation are not respirable. Asbestos fibres are shaped like tiny spears, 1 to 2 microns in size, are very difficult to clear, and can’t be broken down by the body. Fibreglass fibres are typically 15 microns and can’t access the lower respiratory system. They can also be removed from the lungs by normal body processes more easily, and can even be dissolved. When being cleared the body coats the glass pieces with mucous, forming a “buffer” around them so they can eventually be coughed up. There is little research into low level exposures, but in one study a correlation was found between MMMF’s (Man Made Mineral Fibres) in settled dust and sick building complaints. [v] In another publication[vi] the section on MMMF concluded that fibreglass particles can irritate the skin and mucous membranes of the respiratory tract. In lab animals fibreglass may cause fibrosis of the lungs and lining of the chest. The Cutter Corporation’s Particulates in Indoor Environments says that MMMF’s such as these may cause cancer in the long term, but most research concerns people who work frequently with the fibres. [viii] In one case study, two healthy males aged 21 and 28 were working on a home installation, and both developed bronchitis and atelectasis (blockage of the air passages) of the lung. Children are generally more vulnerable than adult males, and it is not known if exposure early in life will have consequences or not. It is wise to protect them from unnecessary exposures. When dealing with children there are other factors as well. In one school’s Home Study Program, new slide-in dishwashers and stoves were delivered and left for weeks waiting for the overworked maintenance staff to install them. During that time, much of the loose insulation around some of the machines was pulled at or otherwise disturbed by students to the point where an urgent installation was necessary to remove the possibility of harm to either the students or the machines. In schools, if the space between the tiles and the floor slab above is used to return re-circulated air, the moving air could pick up fiberglass fibres (and some settled dust) and distribute some of them to the breathing zone. This is partly because the recirculation filters may not be good enough to capture all the particles. The tiles are sometimes made to vibrate and changes in air pressure from above and below cause particles to be re-suspended in the return (recirculating) air stream. It is best to avoid vinyl surfaced tiles. The white face of the less expensive fiberglass tiles is typically Vinyl (PVC) which off-gasses, particularly when new, and can emit toxic gasses during a fire. Inexpensive fiberglass tiles are not very strong, tend to sag, and will emit fibres when lifted for any maintenance. They also may be difficult to recycle due to the vinyl face. The tiles more commonly used in offices and schools may be either mineral fiber tiles, which emit fewer fibres than some other fiberglass tiles, or cellulose tiles which would typically not emit fibres of concern. Some fire-rated tiles contain fire retardants, which may be of concern depending on the type. Fibreglass ceiling tiles may have formaldehyde glues as a binder. Formaldehyde is a carcinogen, so it is wise to ensure the glues are safe. Fibreglass insulation is a healthy product for insulating as long as it is handled properly and sealed off from indoor air or contamination sources. If internal duct lining is required, be prepared to replace it within seven to ten years, as breakdown often occurs in that time frame. Fiberglass insulation that is wet or contaminated or showing signs of breaking down should be promptly removed, whether it is in walls or around ducts or in other forms of use. Removal of fibreglass duct lining should be done using appropriate isolation techniques, personal protection for the workers, and a thorough clean-up before occupants return to the area. Healthy Schools Design and Construction Guidelines advise that new school buildings and renovations should not use fibrous insulation inside duct work. 15 (1) Where a non-industrial workplace is constructed after these regulations come into effect or is modified pursuant to Section 24 and sound control is necessary to prevent excessive fan or vibration noise from travelling through duct work, the employer shall where reasonably practicable, install a prefabricated sound attenuator, such as a duct silencer. High efficiency filters over a fibreglass lined air duct or diffuser may work temporarily, but this may alter the amount of air delivered or overwork the fan motor. Take reasonable isolation precautions to protect building occupants. For example, in schools, as with gyproc dust or any construction work, isolate from children/occupants, cover desks etc., and clean up well afterward. It is not necessary to use negative air precautions unless a large area is being disturbed/installed. Use common sense. Thoroughly clean up prior to occupants return to the area. Most research on health hazards from building material exposure relates to effects on healthy adult males. Children’s developing and vulnerable bodies warrant extra protection. CASLE (Canadians for A Safe Learning Environment) and health professionals recommend exceeding existing standards when dealing with children. Some experts caution that exposure to fibreglass particles can cause rashes, bronchitis, or problems with lung function, and that over a lifetime, exposures to fibreglass inhalation in children could increase the possibility of more serious illness later in life. With individuals who have become environmentally sensitive, a well-controlled “clean” environment is usually needed. These individuals generally find sealed fibreglass insulation to be a product of choice once it is gassed off. Because schools house individuals with a cross section of health conditions, it is wise to prevent exposure to airborne fibreglass from any source, and also to prevent exposures to dirt, microbes, and chemical contaminants from contaminated fibreglass lined ducts. Fibreglass insulation is a healthy choice for schools when it is installed wisely and handled properly in order to prevent possible harm, especially to children, from known and controllable risks. [vi] Staying Healthy in a Risky Environment, N.Y. Univ. Medical Centre Family Guide, Arthur Upton, ed. Indoor Airborne Fiber Levels of MMVF in Residential and Commercial Buildings, C.M.Carter et al, 1999. Is This Your Child’s World? Doris Rapp, M.D., p. 533. Staying Healthy in a Risky Environment, N.Y. Univ. Medical Centre Family Guide, Arthur Upton, ed.